Provide world-class support, impress your customers and build lasting relationships, all with less effort. You are always next to your customers with Zoho Support for iPhone/iPad and Android mobile devices. Improve your help desk operation to deliver great customer support that builds lasting relationships. Twitter, Facebook, e-mail… Meet your customers wherever and deliver solutions from the comfort of one, easy-to-use help desk. End the insanity of repetitive tasks and rescue valuable time. Streamline your help desk software with painless, powerful automation. Don’t just skate by, impress your customers with first-class support. Engineer SLAs to ensure you always provide the agreed level of service. Morph your customers into loyal followers. Increase engagement & reduce your ticket load with an intuitive customer self-service portal. You work better when things really fit. Designed to be customized, you can change anything, and everything, to fit your help desk’s unique needs. Organize all incoming requests to simplify your work day. 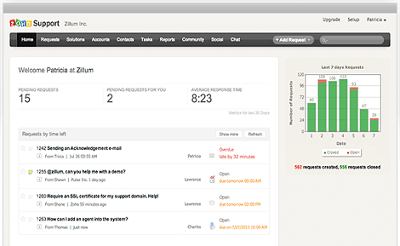 Robust tools enable the unparalleled power of collaborative help desk software. Everything included to help you deliver a great support to your customers every time. Zoho Desk acts as your single point of contact for all your incoming tickets. 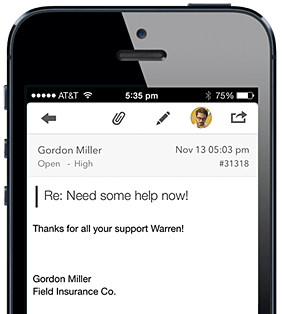 You can organize, prioritize and respond to your support tickets on the fly. Provide the ‘Wow’ experience to your customers by maintaining the most responsive helpdesk in your organization. Do you have scores of contacts and support multiple accounts? Have them all in Zoho Desk. You can raise tickets for your contacts and accounts from anywhere and at any time. You can also customize the fields in contacts and accounts to capture as much information you may need. Provide your customers with a powerful knowledgebase of articles ordered as topics. Found a solution for a ticket; add them to your knowledgebase in a click. You can also create topics for your agents’ eyes only. Solutions are fast to search and can contain attachments and images. In the self-service Customer Support Portal your customers can log tickets, track the progress of their requests, find answers, start discussions and more in one single place. You can also unleash your brand’s look and feel using real-time styling, drag-n-drop rearranging, etc, for that seamless experience. 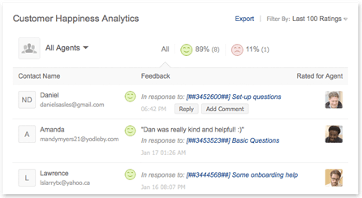 Measure your customer’s support experience by sending out a rating link whenever you close a request. You can receive notifications for bad feedbacks, so you could get into damage control mode right away. Happiness reports are insightful, and help you monitor your company’s customer happiness levels for any given period. So, get started now and be all ears! Regardless of your size or needs, start delivering unmatched support. Prices are in dollars (USD). We are an experienced Zoho Alliance Partner that can assure a smooth and quick adoption of Zoho Desk by providing services at a competitive pricing. Choose us as your Zoho Desk partner wherever you are : Albania, Andorra, Angola, Armenia, Belarus, Belgique (Belgium), Bosnia and Herzegovina, Brazil, Bulgaria, Croatia, Czech Republic, Danmark, Deutschland (Germany), España (Spain), Estonia, Finland, France, Georgia, Greece, Green Cape Islands, Hungary, Ireland, Island, Italia (Italy), Latvia, Lithuania, Malta, Moldova, Mónaco, Mozambique, Nederland (Netherlands), Norge (Norway), Polska (Poland), Portugal, Romania, Russia, São Tomé e Princípe, Serbia, Slovakia, Slovenia, Suisse (Switzerland), Sverige (Sweden), Turkey, Ukraine, United Kingdom, …) and benefit from the experience of the cloud business solutions leader.